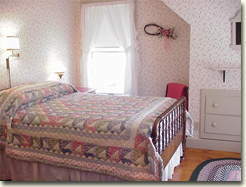 Mountain View Inn has seven guest bedrooms. 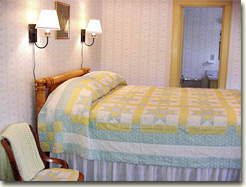 All of our rooms are basically the same in that they accommodate two people and each has a private bath with shower. Each is individually decorated with its own "personality" and unique with its own beautiful views. It is truly a "home away from home" in the country. Room #1Grandma's Room. 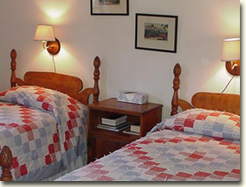 A comfortable west facing room, carpeted, double bed. Room #2Twin Room. Our only room with twin beds, built-in drawers. Room #3Mary and Eleanor Room. 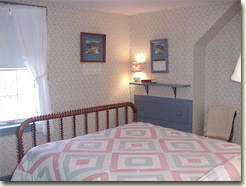 Sunny east facing room, decorated in pink and blue, double bed. Room #4Uncle Charlie's Room. A double "Rolling Pin" bed and antique step table. Room #5Canopy Bedroom. 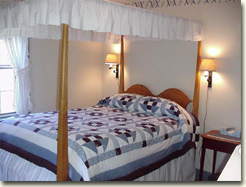 Located at the back of the house, nice view of the mountains, queen bed. Room #6Queen Bedroom. Located at the back of the house, can fit extra bed for a child. Room #7Elisabeth vonTrapp Room. A sunny queen bedded room with built in drawers and a table which can be used as a desk. General Notes. 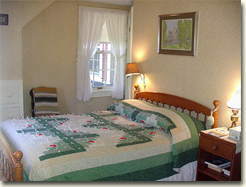 Room rates are $140.00 per night including breakfast during Foliage and Ski seasons. A two night minimum stay is required on weekends. 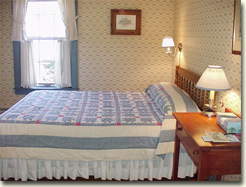 We take a 50% deposit or one night's lodging deposit when the reservation is made. We require a 14-day notice of cancellation for a full refund. We reserve the right to charge the full amount of the reservation if cancellation notice is received within 48 hours of anticipated arrival or if the guest fails to arrive. If the deposit is made by credit card, 5% of the deposit will be deducted from the deposit refund to cover the costs of credit card processing. We are a non-smoking inn. Children are welcome. We are sorry, although we love pets, we cannot accommodate them in the inn. You may check room availability and request a reservation on-line if you wish. This link will open a new browser window. Please close it to come back to our site, and please contact us if you have any questions so that we may personally serve you.